Data Recovery for Excel (ExcelFIX) is a powerful program for the recovery of data from Excel files that display an error on opening. This Data Recovery for Excel solution recovers charts, images, comments, merged cells, groups and outlines, subtotals, as well as formula elements including names, external references and multiple sheet ranges. The data recovery process takes just 15 minutes and is executed safely and confidentially on the user's computer. 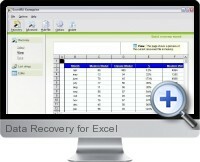 Furthermore, Data Recovery for Excel is compatible with Excel 95, 97, 2000, 2002 (XP), 2003, 2007 and 2010. Data Recovery: Advanced repair that recreates damaged or corrupt Microsoft Excel files. Excel Version Support: Restores all file formats for Microsoft Excel 95, 97, 2000, XP, 2003, 2007 and 2010 on Windows 98 or higher. Cell values: Recovers all types of values including texts, numbers, dates and hyperlinks. Cell formulas: Recovers all operators, operands and functions as well as names and all types of references, including external references and multiple sheet ranges. Cell formatting: Recovers number formats, alignment, fonts, borders and patterns without distorting formatting and preserving the original appearance of the file. Cell comments: Full recovery of cell comment content and attachment. Merged cells: Merged cell formatting is recovered and restored. Charts: All charts and associated formatting are recovered. Group and outline: Groups and outlines from damaged files are restored. Structural elements: Recovers sheet names, column width and height, subtotals, printer settings, page breaks, zoom factor and other elements. Images: Recovers embedded images and other embedded objects. Multiple File Recovery: Recovers multiple selected files in a single operation. Simple Usability: Easy to use interface with useful contextual information. Multiple languages: The Data Recovery for Excel software interface and documentation is available in English, Spanish, French, German, Portuguese, Dutch and Italian. Standards Certified: Data Recovery for Excel is ISO 9001:2000 certified in accordance with the highest industry standards.